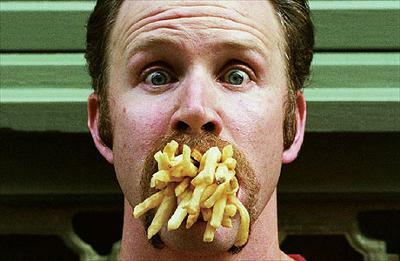 Supersize Me star Morgan Spurlock's got nothing on a gym instructor who piled on 105 pounds (47.6 kg) in a risky bid to understand obesity first hand. Ex-model Paul 'PJ' James, of Melbourne, Australia ditched his healthy diet of lean meat, grilled fish and green leafy vegetables for fried food, kebabs and curries on New Year's Day. The once-fit and slim 32-year-old now weighs in at 280 pounds (127 kg) and feels constantly tired and lethargic. He's also plagued with cravings for sweet treats and high calorie snacks. James said started pigging out to better understand his overweight gym clients. "I can really understand how hard it is," he said. "Once you start eating an unhealthy diet it is tough to break that cycle." He plans to start losing the weight again on July 1. Spurlock popularized the human guinea pig approach to obesity research when he spent a month eating nothing but McDonald's food and filming the effects on his health and waistline. He earned an Oscar nomination for his efforts. Comments for Supersize THIS, Morgan Spurlock! You are right that the once formed habit is tough to break! It should be done ruthlessly and without hesitation! Otherwise, pitiful consequences are waiting for us!! !